The Province of Manitoba and Environment Canada issued a State of Lake Winnipeg Report which is reporting on conditions on the lake between 1999 and 2007. Condensed highlights are available here. It is helpful to get a comprehensive report on the issues affecting the lake including algal blooms, invasive species, and climate change. There does not seem to be any dramatic news included in this report and perhaps that is because it is reporting on data from 4 years ago. It does make one wonder why it would take 4 years to collate and analyze the data. 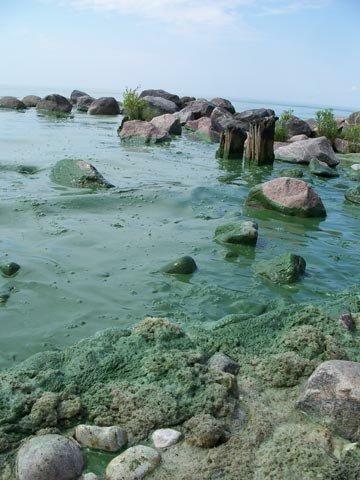 The most important message, I think, is that the blue-green algae blooms are dominated by cyanobacteria which contains a toxin, microcystin-LR , that is harmful to humans and animals. Along with this report the Province of Manitoba is proposing water quality standards for municipal and industrial wastewater treatment. The standards are addressing the amount of phosphorus and nitrogen, in some circumstances, that remains in the wastewater once it is discharged to local waterways. They are seeking feedback on these standards by Aug. 4, 2011. I understand that the province collects data each year on the amount of phosphorus and nitrogen entering Lake Winnipeg from the various rivers that supply the lake. I think it would be helpful if we could see those numbers every year so that we can understand, in measurable terms, whether the problems associated with the blue-green algae blooms are getting better or worse. I hope that we can access this data on a more timely basis in the future. Many shallow lakes in China also face the same problem:toxic blue-green algae blooms.And many researches have done on this problem and some usefull methods have developed.First,you should understand the eutrophication is a nature progress for shallow lake ecosystem,second,the eutrophication is helpfull to many species.The main aim is to control the species we don’t like,such as toxic blue-green algae,not to fight back the nature process. Thank you for reminding us of the need to respect natural processes. I agree with that completely. However the blue-green algae in Lake Winnipeg is dominating the algae spectrum and some of it contains microcystin L-R so we need to be very cautious. Perhaps we can learn from some of the experiences in China.